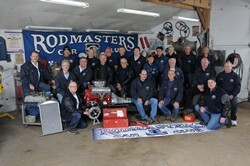 The Rodmasters Car Club has been in continuous operation since 1971. Primary interest is in pre-1948 North American and special interest vehicles. The club has twenty active members and maintains a clubhouse in Binbrook, Ontario where each member has their own individual car and work bays. The club is active in the community, attending car shows, cruises, and swap meets and by supporting many local charitable causes. Founded in November of 1970, four friends, looking for a place to store their cars for the winter became aware of an unused turkey barn near the town of Binbrook, Ontario. After negotiations a deal was made, on the condition that they could come to terms with four other individuals who were also inquiring about the facility. An agreement was reached and the eight decided to share the barn, each paying a rental fee to the owner. As word spread, more people began to inquire about available space. The owner was approached with a proposal of a single fee for the premises and in the spring of 1971 the "Rodmasters Car Club" was born. In July 1973 the club hosted it's first car show at the Binbrook Fairgrounds. The fairgrounds were soon outgrown and the show was moved down the road to Shady Acres and became a two-day event. After many successful years including a move to the Caledonia Fairgrounds, the focus switched to the current spring swap meet and fall swap meet/car show, held the last Sundays of March and October at the Ancaster Fairgrounds. The club marked its 30th anniversary by hosting the 2001 Canadian Street Rod and Custom Car Nationals (CANATS) at Confederation Park in Hamilton, Ontario. Over two thousand registered vehicles attended the three-day event. In 2011 the 40th celebration was held at the Ancaster Fairground’s Marritt Hall. The day featured a scenic rod tour and a dinner and dance for five hundred with a live band. All proceeds went to a very worthwhile local charity. Last summer the club held its first Collector Car Appreciation Day, in the hope of making it an annual event. Plans are in the works to make the 50th anniversary in 2021 a memorable milestone for The Rodmasters Car Club.